Kryptonian Warrior: X-Men: Days Of Future Past - Possible Post-Credits Apocalypse Scene Spoiler? X-Men: Days Of Future Past - Possible Post-Credits Apocalypse Scene Spoiler? At this point I'd take the following news with a pinch of salt as I really can't see this being true, although directors have always had licence for artistic interpretation with well known characters and their histories and powers etc. Supposedly this is the breakdown of the post credits scene to X-Men: Days of Future Past which follows on to X-Men: Apocalypse in 2016. The information is from firstshowing.net and sourced from geektyrant.com. It doesn't mean it's true, but they seem to think it is! "The alien responds, 'I am your future.' Suddenly Apocalypse merges with Magneto, who screams and blasts an insane amount of energy and shockwaves around him. This energy explosion levels everything around him, with a blast radius that goes for miles. As Magneto looks at what he's done, he has a realization of the power he now holds and a villainous grin begins to form before the film cuts to black." 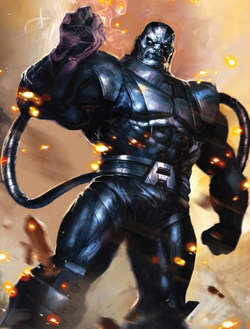 This obviously isn't the Apocalypse we know from the comics and cartoons and it sounds a little poor having been given the exciting news that Apocalypse was going to feature in the new film. We want the big guy front and centre!! !